Here are some thumbnail sized pictures exchanged for viewing on the Caique Mailing List. To view a larger copy of the image simply click on the picture and it will take you to that larger image. To come back to this page use your back button, back command or click on the back link. 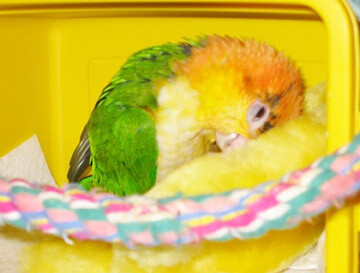 The photos you see here are those belonging to Vicki Johnson and Harley the White Bellied Caique. For Pictures of my own birds, a Timneh African Grey named Aki and a Greenwing Macaw named Hero click right here. For more pictures of birds (Blue Front Amazon, Male Eclectus, Blue and Gold Macaw, Double Yellow Head Amazons ) click right here.